The Wave sits peacefully in no man’s land at the border of Arizona and Utah. This unique sandstone formation displays vivid red desert strata that have been eroded overtime into a wavelike feature. The otherworldly contours evoke wonder and awe from all who visit but even just getting there can be a bit of a miracle. I first heard about The Wave a few years ago and added it to my bucket list. This fall while checking my maps for possible routes west I realized that I could finally attempt to see The Wave and jumped on the opportunity. 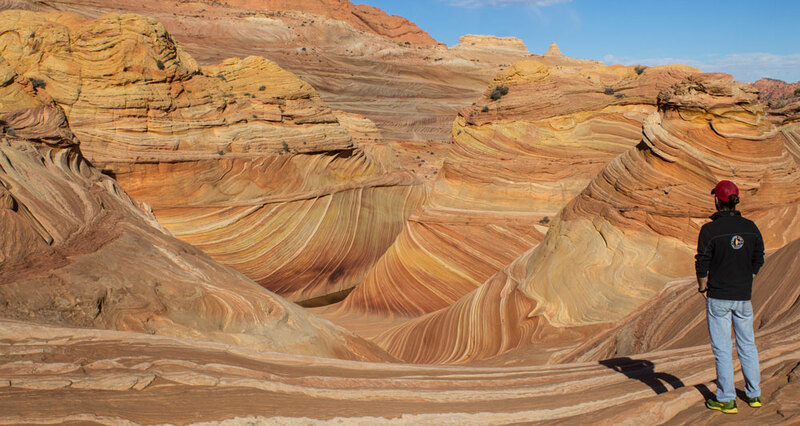 The Federal Buerau of Land Management is the overseer of the Coyote Buttes in the Paria Canyon-Vermilion Cliffs Wilderness where The Wave is situated. It is so delicate that the BLM sets a limit of 20 visitors per day via a lottery system. I’d heard stories of how difficult it could be to get one of the 10 in-person lottery spots so I rolled into Kanab, Utah fully prepared to be there for several days until I could obtain a permit. To enter the in-person lottery you show up at the BLM office in Kanab before 8:30 AM and fill out an application. At 9:00 AM sharp a Ranger starts the lottery that goes until all 10 spots are filled. If only 10 people are present, all 10 will get a permit. More often though 20, 30, up to 100 people are entered into the lottery and the chances of getting a permit quickly diminish. I had all week and was ready to wait it out. I submitted my application and sat patiently in the back. At the top of the hour there were only 19 people in the room and I was feeling good. The Ranger started the process and the first number he picked was mine! I stuck around to get the map and directions to the trail and then headed to the local library to get some work done. 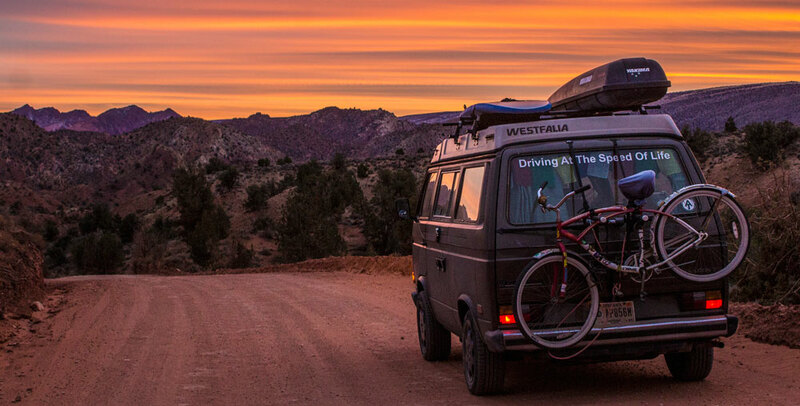 Before sunset I rambled an hour out of town down desert dirt roads to the State Line Campground and camped totally alone that night, not another human for miles. In the morning I drove to the Wire Pass trailhead and started my hike. The map with photos was easy to follow and I arrived mid-morning under heavy clouds. I climbed, scrambled, and explored all around the rocks and waited as the wind picked up and pushed the clouds across the desert plain. Around noon, ideal time to photograph The Wave, the sun popped out and I spent an hour taking hundreds of photos of this unique landscape. I travel solo most of the time so I’m adept at using a remote shutter to take photos of myself. I set up my tripod, weighted it with my hiking pack, and started snapping photos. The wind really picked up and during one photo sesh I heard a squall roll through and turned just in time to see my camera fall 15 feet down a vertical cliff face and smash on the sandstone. The autofocus was broken but I cranked on the lens and snapped it back into position, phew. You’d think that I’d learned my lesson, but a few minutes later I was doing the same self portraits when another gust of wind toppled my camera down another slab of sandstone. This time the autofocus was broken for good. It was worth the casualty because I have once in a lifetime photos from a once in a lifetime place! I made it back to my van by mid-afternoon and the entire adventure took only a few hours. 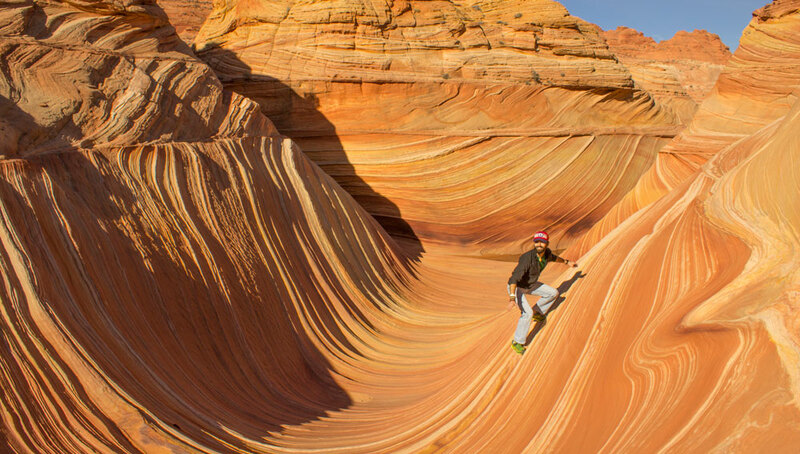 If you find yourself in Southern Utah or Northern Arizona and have a few days to spare I highly recommend entering the lottery to get a permit to hike The Wave. For more information about The Wave and the permit process click the links below. When was your walk in lottery? I tried my luck yesterday and there were more than 100 people for 10 spots! Hey Lisa! I think the lottery I hit was on a Monday late in November, and the weather was pretty cold. Somehow luckily there weren’t many people there! Hope you get a chance to try it again soon!